We are web connected and head over to Google or specific online dictionary to look for meaning of specific words. How about goodness of best of dictionaries on your computer itself? Ultimate Dictionary is one big daddy of best dictionaries around. It has collection of over 30+ dictionaries, thesauruses and glossaries. 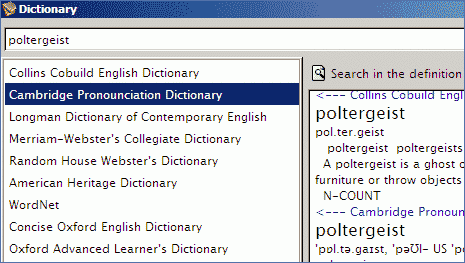 Search for any word and get results from different dictionaries. You can jump between results from different dictionaries or stick to the dictionary source of your choice. It has very simple interface for easy search and management of your huge dictionary. You can also install and add new dictionaries to your Ultimate dictionary collection. It supports English, Spanish, French and Polish word references. You can also enable pronunciation in the dictionary by download separate files. Download Ultimate Dictionary – 150MB [link], its all free and very useful!